Use this beautiful drawstring bag silkscreened with a gold Sri Yantra to store your mala in to maintain its purity and potency. The Sri Chakra yantra is a geometrical representation of the infinite power of the Goddess and is used as a meditation tool to connect to universal consciousness. 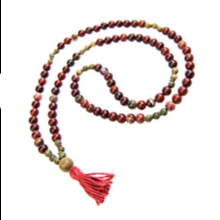 This mala bag fits wrist malas and small full malas. Made in Bali. Available in red, black, green, purple, blue and sky blue.